This is the purest form of archery. No sights and no modern technology. Most longbows are made from several different types of wood bonded together to provide strength and to give the bow it’s power. Typically and gentleman archery would have a bow around 50lb/60lb and a lady archer around 30lb/40lb. Arrows are also made of wood with steel or brass points and feather fletchings. 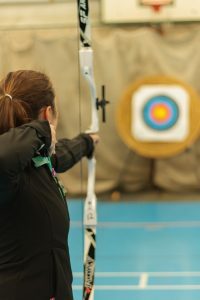 Achieving high and consistent scores with longbow requires a huge amount of skill, yet it is also one of the most enjoyable types of archery due to it simplicity. When using a longbow it’s hard not to think of the history behind the bow and films such as Lord of the Rings and the many versions of the Robin Hood story, have made the longbow more popular than ever. Many recurve and compound archers will also have a longbow. A flatbow is a bow with non-recurved, flat, relatively wide limbs that are approximately rectangular in cross-section. Because the limbs are relatively wide, flatbows will usually narrow and become deeper at the handle, with a rounded, non-bending handle for easier grip. This design differs from that of a longbow, which has rounded limbs that are circular or D shaped in cross-section, and is usually widest at the handle. 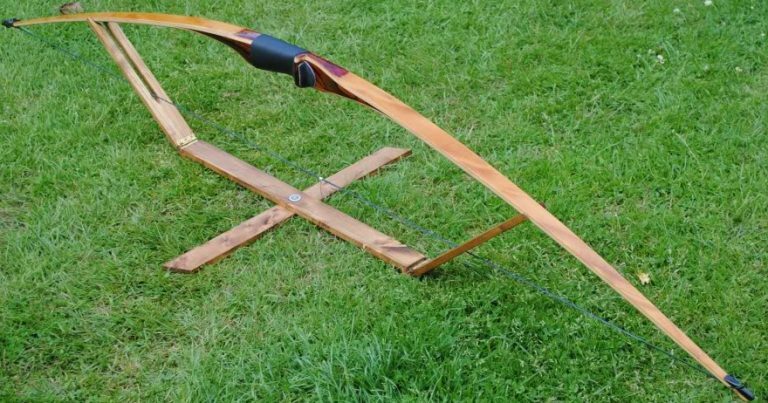 A flatbow can be just as long as a longbow, but can be very short. (Typical lengths would be 68–70″ for a flatbow, 70–72″ for an English longbow, and 72–76″ for a warbow-weight English longbow; but these styles may easily overlap each other.) Traditional flatbows are usually wooden self bows (bows made of one solid piece of wood),though laminated and composite flatbows have been made in ancient and modern times. Modern flatbows commonly use fibreglass. Recurve bows come in many different forms. Some are beautifully crafted one-piece bows, such as those made by Border Archery in Scotland. But most are described as ‘take down’ bows, which means they can be taken down or apart for ease of storage and transport. They consist of three main pieces; the handle, known as the riser and the top and bottom limbs. There are wooden versions of a three piece recurve bow and these are relatively inexpensive, hence they are used by most clubs to train new archers. The bow above is a modern competition recurve with CNC machined riser and carbon-fibre laminated limbs. There are also carbon-fibre risers available and a host of accessories such as sights and stabilisers to help the modern recurve archer achieve better scores. Also the limbs can be changed as an archer progresses or wants to upgrade without having to buy a completely new bow. Arrows are either aluminium, aluminium/carbon-fibre composite or complete carbon-fibre, all with steel points and plastic fetchings. Compound bows are the most recent innovation in archery, developed in the late 60’s in the US they are now the most widely used bow in the United States. Unlike all other types of bow, compound bows use a combination of pulleys and cams to increase the power of the bow. The more power, the more accuracy and compounds have lots of power. The two most important differences however are in how the bow delivers this power and how the archer releases the arrow. 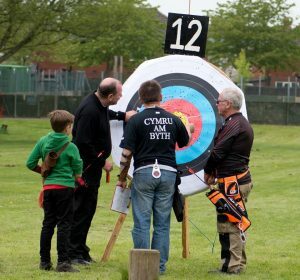 In all other forms of archery the archer pulls the string with their fingers, this means the heavier the bow – by this we mean the poundage of the bow and therefore how much effort is needed to pull the string to full draw – the harder it is to use. Not so with a compound for two reasons. Firstly, as the string is pulled, the cams rotate and at a certain point the ‘weight’ comes off the string, meaning the bow can be held at full draw for a long time. Secondly, most compound archers use a something called a ‘release aid’. This is a trigger device that attaches to the string, this is then used to pull the bow and release the string. This ensures a near perfect release of the string and arrow on every occasion. These bows are more expensive generally than longbows or recurves. They use similar arrows to recuve bows.